Fight the Emperor and the stormtroopers with this Jedi lightsaber. The Star Wars accessory includes an injection molded handle with a green blade that extends out of the hilt. When full expanded, the lightsaber measures three feet long. The blade also lights up and requires two "AA" batteries (NOT included). 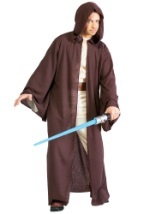 Pair this lightsaber with any of our Jedi costumes and get ready to travel to a galaxy far, far away.